Oh my goodness where did last week go? It seems I lost track of days and didn't get to even write one post! I promise this week will be better, thanks for sticking with me! So let's see, what was I up to last week? 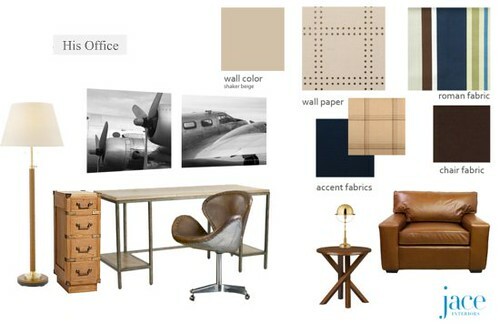 Ashley and I were locked in the office working on multiple projects, below was just one of the fabulous mood boards she created for one of our clients! When pulling a room together, even on a budget we pull from all different sources to create a look that is just right for the space and the clients personality. Here we have items from Circa Lighting, Crate and Barrel, Restoration Hardware, Ballard Designs, Duralee Fabrics, Mitchell Gold, Art.com Serena and; Lily and Wallpaper from Phillip Jeffries. I was so honored High Point Market asked me to contribute an article to their latest newsletter. 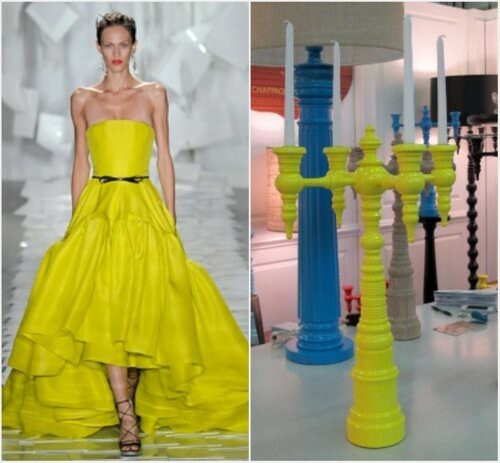 The topic was how yellow in fashion is having a big influence in home interiors this year especially in accents! My favorite pick from the runway was this Jason Wu dress and the accent that went perfectly with it, was the newly introduced Dunes and Duchess No Scurvy Lemon Candelabra! Such a happy duo! Love that mood board - perfect for men. Thanks for sharing a project with us! I love following the creative process designers go through. That yellow dress is to die for!! That creative process is so magical when an artist can stand back and smile at their creation. Thanks ladies for stopping by! I am dying to see the Phillip Jeffries Rivet wallpaper up it is going to look cozy and masculine! Tracey I agree, that yellow dress is incredible! Then again anything Jason Wu creates I fall in love with!